April was super-boring for me, and I am bummed I found out about YALL West after it happened. I’m totally going next year (assuming it is happening next year, and that it’s in Southern California). And I didn’t go to the LA Times Festival Of Books, because I wasn’t really interested in any of the panels or speakers enough to go up, and I didn’t really want to go up for just walking around yet. I also got my hair cut, and I’ve been really lazy about taking a picture of it. Maybe I’ll actually get around to that this month. I don’t know why I have this one as its own section, since this one is going to be its own post from now on. Habit, probably, but you can check out that post here. I’ve been crocheting! It seems like lately, I’ve only been crocheting when I was at my knitting/crochet group, because that was the only time I could muster up enough energy to actually crochet anything. But last month, I made a hat, started on a bag, and I worked on a blanket I started last year. It’s been too warm the last few days to work on the blanket, but I’m hoping it cools down enough that I can work on it at least a little. It’s not that long yet, so I’m still at a point where I can still work on it when it’s really warm outside, but it is just long enough that it does keep me warm. I got a few books this month. I’ve been trying not to buy books, because I have so many I haven’t read, and I’m trying to read some of them before I buy more books. It’s actually working pretty well, and if/when I buy books, it’s probably going to be books super-on-sale or ones I absolutely need to read right away. 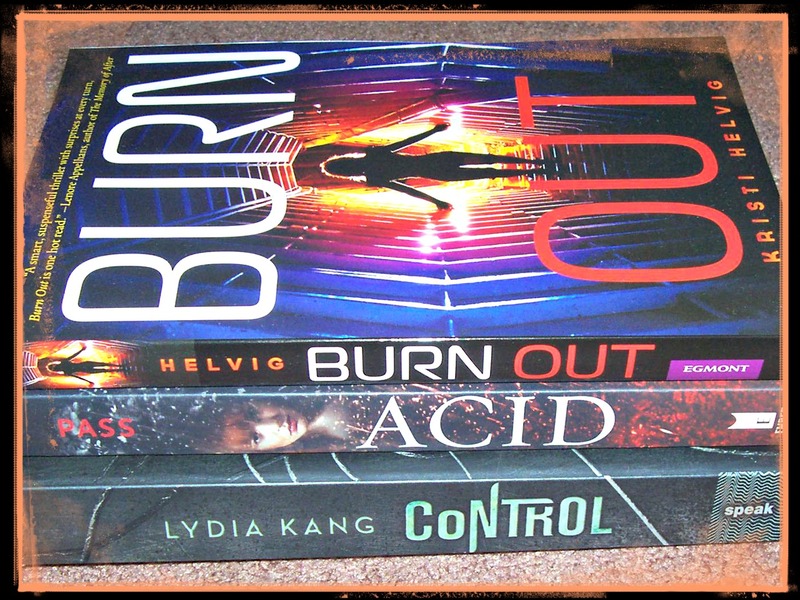 Anyway, I got Burn Out, ACID, & Control from Mysterious Galaxy. I’ve only been there for random book signings, and I keep meaning to go back to actually shop but never manage to, which is weird, because it’s a genre bookstore, and totally my kind of bookstore. But I had to drive up to Escondido for a week, and I was like, I can sit in traffic for over an hour, or I can do something fun and wait it out, so I opted for waiting it out and doing something fun, because that totally made more sense. And since I had to pass the exit for Mysterious Galaxy, it made perfect sense for me to stop by. I also got a couple of crochet books (not pictured, but maybe next month) from the totally awesome Heather and Mike and I’m really looking forward to making new things! And my Audible pick is Hotel On The Corner Of Bitter And Sweet by Jamie Ford, which I’m excited about listening to. I feel like I say that a lot, but it’s true, even though I’m completely horrible at listening to audio books. And I’ve resolved to listen to them more. I think things have calmed down enough that I’m actually able to focus on them, so I’m keeping my fingers crossed that I’ll be listening to more soon! I saw Age Of Ultron yesterday, and it was so much fun! There was a pretty good crowd, but I was expecting more of one…but then again, it’s the benefit of going to a theater that’s not super busy. And if I’m going to watch something like Age Of Ultron, it’s going to be opening weekend, when there’s a ton of people, because it’s always fun to sit in a crowded theater for something like that. At least for me, but I totally get why people avoid theaters on opening weekend. You know how Marvel always has 2 scenes, one a little bit into the credits, and one that’s post credits? Leave once you see the mid-credits one, because that’s the only one. I’ve been watching Dr Who (finally!). I love Rose, and Eccleston was pretty aweome, but I don’t know how I feel about Tennant yet. I’m about to start season 3, so maybe he’ll grow on me? I am sad about Rose going, but it makes sense that the companions would change. And for some weird reason I cannot explain, I totally imagined Daleks as Ewok-type creatures. And I wasn’t that surprised by a recent event in Gray’s Anatomy. I don’t want to spoil it for anyone who hasn’t seen it, but I had a feeling it was going to happening when that episode started, so I wasn’t as emotional as I thought I would be. But I was a sobbing mess after the episode last week. I came across some fascinating and fun stuff this month. You can check out everything over on Pinterest. I love this post about Humans Of New York and a girl named Beyonce. Humans Of New York is fascinating, I could spend hours looking at it. Only a related note, Taking Back Detroit is equally interesting and worth checking out. I love this interview with Laurie Halse Anderson and Courtney Summers. This Buzzfeed quiz guessing your age based on your taste in books was a lot of fun, and totally spot-on for me. And I love love love this post over at The Library Canary that’s an open letter to her YA self. I love things like this. I’ve been listening to a few things, but I’ve been listening to the band Joseph a lot. On repeat, over and over, and I can’t stop listening. I first heard about them on The Grapes Of Rad a while back, and they are a really talented group of sisters. I know they’re on tour, and I think they’re coming to San Diego, which, if they are, I really need to get tickets to see them. Seriously, check them out, I think they’re pretty awesome. Happy Sunday and have an awesome May!